Wow -- what a weekend it was for one lucky Intertops Casino! Janusz Z. hit the jackpot recently playing the Let ‘Em Ride poker game and won $286,924! By the next day he'd turned that win into more than $900,000. 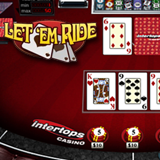 Let 'Em Ride is a slower, relaxed form of online poker game. You play with the dealer, not against other players, so they you can play at yourown speed. By the next day the jackpot winner had $900,000 in his account! The most amazing and often lucrative feature of Let ’Em Ride is its progressive jackpot, which is how Janusz won so much. A minimum $1 bet is placed before their first three cards and two community cards are dealt. You can raise your bet or fold as the community cards are revealed. But to be eligible for the progressive jackpot, you must also place a $1 side bet. If you then get a Royal Flush you win the entire jackpot. A straight flush wins 10% of the jackpot, four-of-a-kind wins $500. The payout for a Full House is $100, a Flush pays $75. Intertops also has several slot games with huge progressive jackpots. The biggest are on Aztec’s Millions ($2,357,245) and Jackpot Piñatas ($1,810,996). The current jackpot on Cleopatra’s Gold, featured in this month’s Ancient Superstars bonus competition, is nearly $400,000. During the $120,000 Ancient Superstars bonus contest, frequent players compete for top bonuses., You can win up to $500 every week until December 4th. If you make it to the top 20 in any week you'll be entered in a draw for a $1000 cash prize (with no wagering requirements). Intertops Casino has a wide selection of online slots and table games from Realtime Gaming including the brand new Swindle All the Way Christmas slot game favorite Christmas slots like Rudolph’s Revenge and Naughty or Nice.